On Tuesday Eliana, Nick, Sarah, and I traveled to an ancient port city whose transliterated name has yet to be decided on. 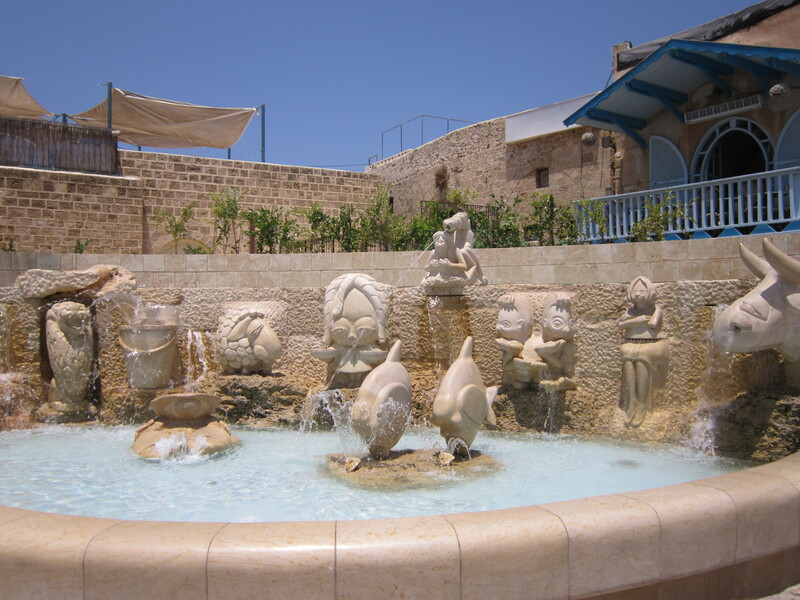 It was a spectacular sunny day with temperatures in the high nineties. 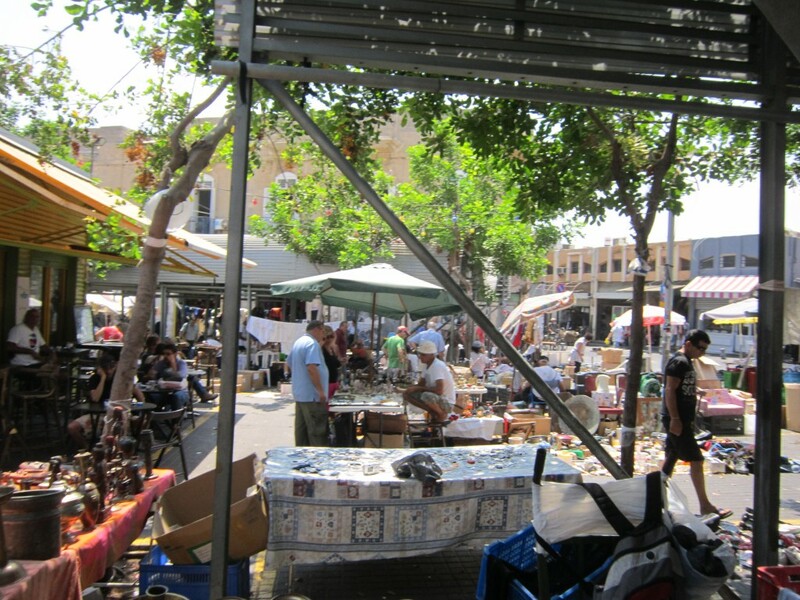 First, we stopped by Jaffa/Yafo’s flea market where you can buy anything your heart desires or your mind dreams up. Literally, anything: bicycle horns, television remotes from the 90s, half-empty boxes of condoms. I bought several pieces of jewelry there at ridiculously low prices in addition to a stylish pair of sunglasses for only fifteen shekels. Part of the flea market. 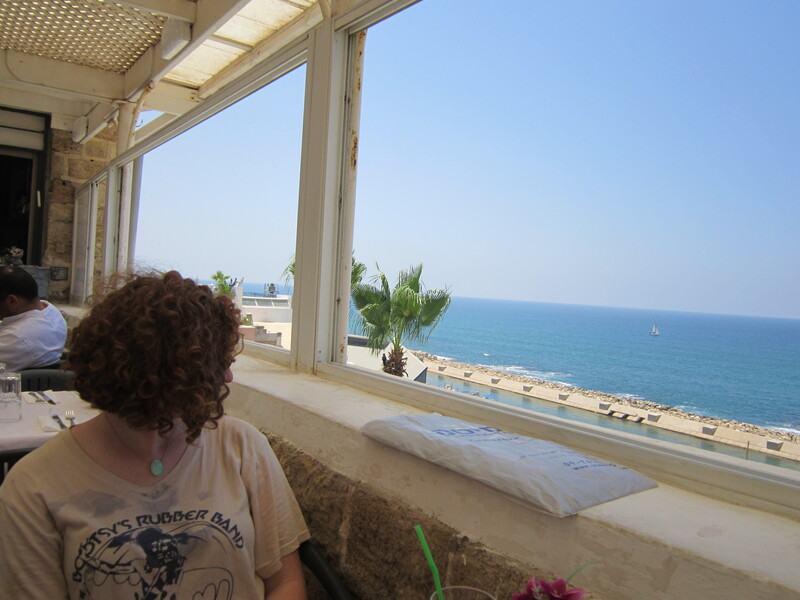 Next, we headed to Old Jaffa where we had lunch right by the water. It was decent, however, Nick had the blandest shakshuka I had ever tasted. We also tried looking for an ice cream place that was rumored to have hummus flavored ice cream, but we searched to no avail. I did have falafel before we headed home, in spite of its much inflated price (8 shekels more expensive than the ones in French Hill). No matter; falafel is always worth it. After a few hours of wandering around we decided to walk along the shore. That is when Nick and Sarah decided to rent bicycles. In Tel Aviv, one can rent a bicycle for 14 shekels a day using a debit card. The only problem was that because balance has never been one of my strong points, I never learned how to ride a bike. After half an hour of Sarah trying to teach me, me screaming “I don’t want to die and take everyone on the sidewalk with me!”, and Nick photographing the entire fiasco, we decided to give up. Then, we found a giant jungle gym made out of rope to climb on. Did I mention I was wearing a form-fitting mini skirt the entire day? Basically, I’m the number one public enemy of the ultra-orthodox. Sarah contemplating on all the valuable insights she has heard while in Israel this summer. As she looks West out into the Mediterranean, she wonders what newly acquired knowledge and skills she will able to bring back with her to New Jersey. To top off the day, we ran through sprinklers at the park and then had gelato. Ah, what I wouldn’t give to be young again!